Located within the heart of Sydney, Aerial UTS Function Centre offers inspiring views, state-of the-art facilities and the very latest in technology. It is a short distance from the entertainment quarter of Darling Harbour, as well as the inner city restaurants and bars of Glebe, Chippendale and Surry Hills. The Function Centre is home of the Fifth International Symposium on Stock Enhancement & Sea Ranching. The Conference Secretariat has confirmed rooms at several hotels close to the Symposium venue. Delegates are encouraged to secure accommodation through the Conference Secretariat to ensure access to the negotiated competitive rates. These accommodation deals can be booked by contacting the Conference Secretariator via the online registration form. If you wish to organize your accommodation independently at other venues not listed here, cheaper rooms are available in Sydney (AUD100-AUD150) in the vicinity of the conference venue. A list of reputable hotels in Sydney can be found at the Desination NSW website, otherwise cheap accommodation deals can often be booked through commercial websites like lastminute.com.au, Trivago and Booking.com.au. Rates: Rates quoted are per room per night, based on single/double/twin occupancy, inclusive of 10% Australian Goods and Services Tax, and subject to availability. Deposits: Accommodation will not be confirmed until a deposit of one night's tariff is received or a full deposit by electronic funds transfer or cheque is made. This deposit will be forwarded to your hotel and will be credited to your room account. Delegates must settle the balance of their account with the hotel concerned upon check out. If accommodation deposits are not received by Monday 19th October 2015 your room will be released back to the hotel. The Conference Secretariat does not take responsibility for accommodation if deposits are not received by this date. Deadline for accommodation bookings: The Conference Secretariat must return all unsold rooms to the hotels/apartments on Monday 19 October 2015, therefore accommodation bookings after this date cannot be guaranteed. The rates quoted are only valid for bookings made by Monday 19 October 2015. Cancellation: No accommodation deposits will be refunded after Aug 31 2015. Delegates who confirm an accommodation booking with a credit card and who cancel after Monday 31 August 2015 or delegates, who fail to arrive on the specified date, will be charged for the entire cost of their accommodation. Late bookings: Late bookings can be made through the Conference Secretariat after Monday 19 October 2015 but are subject to availability, and credit card details are required to secure the reservation. Early arrival: Some flights arrive into Sydney in the very early morning. As check in is at 1400 at most hotels, your room may not be ready for immediate occupation if you arrive early. Whilst hotels will do everything possible to accommodate early arrivals, if you wish to be guaranteed immediate occupation you can pay an extra day's tariff for the night before you are due to arrive. If you wish to take this precaution, please advise the Conference Secretariat on the registration form so that we can notify the hotel. Late arrival: Please indicate if you will arrive at your hotel after 1800 on the day of check in. Failure to do so might result in your booking being cancelled and your room given to someone else. Change of booking: Any change in booking must be made in writing to the Conference Secretariat and not directly to the hotel. Please note charges may apply after Monday 31st August 2015. A 5% discount has been negotiated for ISSESR 2015 delegates at the following nearby accommodation providers. The following backpacker accommodation options are provided for your information. No discount has been organised with these providers, and delegates will need to organise accommodation directly. 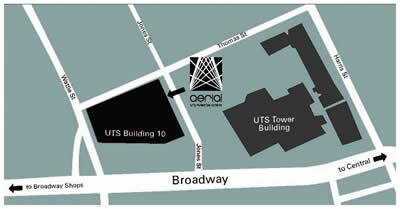 Positioned on the edge of the Sydney CBD within the UTS Broadway Campus, the centre is within close proximity of Central Station, light rail and bus routes. For those choosing to drive, secure on-site parking is offered as well as both paid and un-paid street parking. A short distance from the entertainment quarter at Darling Harbour and the location is just one of the many benefits Aerial has to offer. Sydney Airport is the gateway to Australia, and the main entry point into Australia from most countries. Train (recommended) – AirportLink is the easiest way to get from the airport to the City, via a short 15 minute train trip. At the airport, follow the signs from the Domestic or International Airport Terminals (directions can be found here), and purchase a ticket to the “City Circle”. Central Station is the closest train station to the conference venue and most accommodation; however, if you have booked accommodation elsewhere in the city Museum Station, Town Hall Station, St. James Station or Circular Quay Station may be better options (consult this map when deciding which station to travel to). Information on other forms of transport (Shuttle bus, Taxi, Bus) can be found here. Gateway to Australia and set on one of the world's most stunning harbours, Sydney extends north and south of the harbour in a golden chain of easy-to-reach, inner-city beaches. The temperate climate delivers warm summers and mild winters, with rainfall spreading throughout the year. October temperatures average between 15 °C and 25 °C. 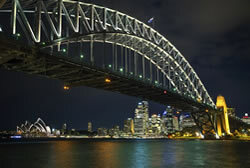 Sydney’s warm climate attracts people to its iconic beaches, most notably Bondi and Manly, almost all year round. To f ind out more about Sydney’s distinct attractions, visit www.sydney.com.